Upload to Database for Excel (Visual Importer) facilitates the transformation and uploading of Excel and other data formats to databases. Upload to Database for Excel is easy to learn and quick - loading over 14,000 records per second for considerable time saving. Multiple delimited or fixed width text files. 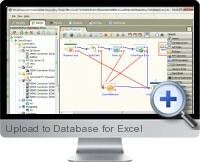 Multiple MS Access databases and multiple tables. Upload to Database for Excel allows you to load data from UTF8, UTF16BE and UTF16LE files with or without BOM. There is full support for international characters for ODBC connections, MS SQL servers and Oracle databases. Upload to Database for Excel can also add new and update old records based on the user defined key.